"the fact of the matter is that you really know something's organic when you find bugs! they obviously wouldn't have made it that far in a non-organic growing environment, so better than any certification or seal on a package, the presence of creatures let you know the plant was healthy and untainted by chemicals"
The National Organic Standards Board Definition of "Organic"
"Organic agriculture is an ecological production management system that promotes and enhances biodiversity, biological cycles and soil biological activity. It is based on minimal use of off-farm inputs and on management practices that restore, maintain and enhance ecological harmony. 'Organic' is a labeling term that denotes products produced under the authority of the Organic Foods Production Act. the principal guidelines for organic production are to use materials and practices that enhance the ecological balance of natural systems and that integrate the parts of the farming system into an ecological whole. Organic agriculture practices cannot ensure that products are completely free of residues; however, methods are used to minimize pollution from air, soil and water. Organic food handlers, processors and retailers adhere to standards that maintain the integrity of organic agricultural products. The primary goal of organic agriculture is to optimize the health and productivity of interdependent communities of soil life, plants, animals and people." 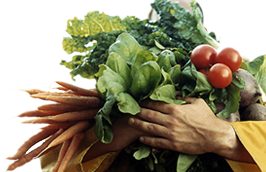 Green Organic Vegetables Inc., is a Canadian based company that since its inception has looked the world over to locate the perfect area in which to produce top quality produce and to that end, an area dedicated solely to the growth and production of organic farming. We are a grower, packer, shipper of 100% certified IQF organic fruit and vegetables with no additives and / or preseratives as we use Non - GMO organic seed. All fruit and vegetables are harvested at their peak; processed withing 1 - 2 hours to perfectly preserve the nutrition and flavor. The fields are tested under ECOCERT and the BRITISH RETAIL CONSORTIUM protocol. The unused balance of the product is composted back into the soil and the only processing done is cutting the produce to exacting specifications. We are able to produce volumes that are not only under our label but also private label and bulk ingredients that other producers use in any one of their applications - be it finished organic fresh salads or organic frozen entree products. "Certified Organic" means the item has been grown according to strict uniform standards that are verified by independent state or private organizations. Certification includes inspection of farm fields and processing facilities, detailed record keeping, and periodic testing of soil and water to ensure that growers and handlers are meeting the standards which have been set. ALL OF OUR VEGETABLES ARE HARVESTED WHEN THEY TELL US ITS TIME, NOT INFLUENCED BY DEMAND OR PRICE. Copyright © 2008 www.sonitek.ca - Toronto website design & Web development company, All rights reserved.